Once again, I've decided to revisit a bourbon that hasn't been the BOTM in a while. It's hard to believe it's been over 7 years. Besides, since last months BOTM was Weller 12, I figured I might as well do OWA this month since it's the other half of our world renowned SB Blend. For the longest time, I preferred Weller 12 over OWA. Well, OWA has grown on me quite a bit in the last year or so. So much so in fact, that my "preference" gap between the two has narrowed significantly. It's pretty much a neck and neck race now. FWIW, I actually have the same number of bottles of each. Well, at least until I put the finishing touches on my OWA blend for the Sampler. My notes: The combination of age and proof really hits a good spot. The nose on the bottle I'm sampling from now is absolutely wonderful. Caramel nuttiness with a touch of spicy fruit. I know the spicy fruit description may sound a bit odd, but I swear I smell something akin to brown sugar/cinnamon and raisin. The legs are medium and evenly spaced, and take their time returning down the sides of the glass. The taste mirrors the nose, although the caramel nuttiness is way more prevalent in the taste. Nice and warm on entry, warming a bit more on the mid-palate, and the finish stays warm and lingers for a good bit. Overall a very, very nice bourbon. Like I said, OWA has kinda grown on me. Now, let's hear what y'all have to say about OWA. OWA has become my favorite BT wheater. I had a bottle a couple years ago that seemed a little off, but since then it has failed to disappoint. I think I need that 107 proof punch to really enjoy this recipe. Candy in a glass. Thanks Joe! This is one of my absolute favorites. A rock solid wheater, at proof, that at times can still be great. Not as good as it once was, but what of the old guard is? Oh, and that fragrant bouquet in the dried glass the next morning is nothing short of heavenly! Paddy is right, especially about that lingering aroma. I'd say, as well that the bouquet on a glass full of OWA is generally stellar, which can result in a bit of a disappointment when first pouring from one of the new bottles. They can be rather more variable in flavor than the older ones were. Still one of my regular pours, and also very useful for creating SB Blend, eh!? Oh yeah, I love this one. That wasn't always the case. 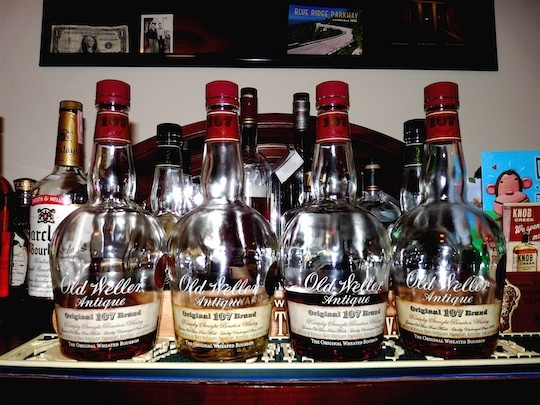 I became fond of Weller 12 early on before I ever tried the OWA. My first OWA was hot and astringent and turned me off to it. I even had a hard time with it in the SB blend. I had to go 70:30 in favor of the Weller 12 to make it work. But I kept hearing good things about it so I bought another and dang if it wasn't better than the ORVW 10yr I bought that same year. Encouraged, I bought more every time I saw it and I'm happy to say that subsequent bottles have been just as good. I'm not the wheater guy I thought I was early on, but OWA always has a place on my shelf. Steve, I had a similar experience. I had a bottle that I didn't like and then stayed away from OWA for a while. I finally had another bottle and it was great. I still prefer W12 however. I opened a bottle of this recently that was raided from my bunker. It's a bottle from a year or two ago. A fellow SB member alerted me that a local chain had some. I had a store closer to me order me a couple. I haven't seen one just on a shelf for years. I like it a lot. As a matter of fact it's consistantly one of my favorite bourbons. I kind of feel funny hyping it up too much because of supply issues. I've been a fan since back in the days of the anchor bottle with the paper label and seven year age. I've got a few bottles tucked away, but a couple months back had the opportunity to buy two bottles at retail price and only bought one. Even with a couple bunkered, I am regretting that decision. Recently, I had a chance to have ORVW in a bar and then one night later, had a pour of OWA. It wasn't a true side by side and I found the ORVW more complex and smooth, but really enjoyed the OWA and was reminded what a tremendous value it is and appreciated that it is somewhat available. I will never leave that second bottle on the shelf again when I get a chance to buy at retail. A very good whiskey that rises to a great whiskey when you factor in the price. Sub $30, OWA is an easy buy; I will not pay any more than $30 as there are bourbons that I like just as well in this price range. It is by far my favorite wheated bourbon that I have tried. It is a smooth, rich, 107 proof bourbon that is all to easy to drink. OWA used to be one of my Big Three regular favorites along with AAA10YO and VOB6YO. The latter two are history and OWA might as well be. I haven't seen any in two years. I posted once that I preferred OWA to W12 even though I "know" W12 is "better." OWA is the Wild Thing you want(ed) to take to the prom even though you knew W12 was a more solid choice. I used to buy this quite a bit, but not so much anymore. Weller 12 is my go-to wheater. In fact, I haven't picked up an OWA in two and a half years, and that's based on my choice, not lack of availability. That bottle I had 2.5 years ago just didn't hit me right and I haven't been back since. Goah, Joe, I am a wheater fan, I love the Wellers, too, and never could decide which was my favorite: I like the age on the 12, but the proof and value of the OWA is (was) tough to beat. Your notes reminded me of what I liked about this juice, but I sure didn't taste all that in the newish bottle I've got open now. And to buy one today, you're off on a hunt or perhaps find one by happenstance in a showcase or behind the counter at a premium price. And at this new price point, there are others I lean to more. Antique is definitely my favorite in the Weller line. For me, it's the heavy, syrupy, and luscious mouthfeel that sets it apart from its brothers, and all other wheaters, IMO. Heck, I'm not sure I can think of many other bourbons at all, that are as thick as OWA. Chewy, slightly burnt, brown sugar sweetness. But, kept in check from getting cloying by the big 107 proof and a cinnamon spiciness. All combine to give this a kick that belies the soft intentions of its wheat flavor grain. Honestly speaking, I have not seen any drop-off in quality since the 7 yr age statement was dropped a few years back. It's been remarkably good ever since, for me. OWA has always been one of my favorites, and was one of my early "wow" moments when diving into bourbon. I have several bottles of what was purported by a reputable store to be a single barrel selected with Harlan Wheatley (the bottles did not have the tell-tale gold SB labels, but I was assured it was a single barrel). In any case, these bottles, and any other OWA I've had off the shelf, always satisfy. I am right on board with smokinjoe's tasting notes. Simply an excellent bourbon. My problem with it is the lack of availability. Out here in NC, as recently as a couple of years ago you would see a dozen bottles on the shelf of every ABC store. Nowadays, I haven't seen it on the shelf in over a year. Does anyone have an understanding of when things will normalize again to some degree? Quick answer: Don't bet the farm on any real 'normalizing' within the next few years. It MAY be a bit better in a year or two; but remember Bourbon needs to age at least 4-years to be any real good, and many brands are aged rather longer than that, and the production increases were only incremental until a couple years ago. Keep in mind that Bourbon demand is also increasing at an unprecedented rate; so anybody saying the tight supply of at least some brands will loosen up soon is probably dreaming. Always a good choice. In fact I just bought a bottle today to add to my bunker. I classify Old Weller Antique as a very good value pick, but it doesn't make the cut beyond that. I enjoyed my last bottle but I can't say I'm crazy about it. At first it was interesting, with the cinnamon "red hots" thing going on, but ultimately I found it a little boring in comparison to others on the shelf. I dunno, when I am in the mood for a wheated bourbon I'd rather go with Weller 12. With a little patience I can occasionally find W12 for just a few dollars more so that's what I'd rather spend my money on. I have some Larceny too but I haven't opened it yet. Tie for first: Weller 12 and OWA, depending on the batch and my mood, followed by Maker's Mark CS.